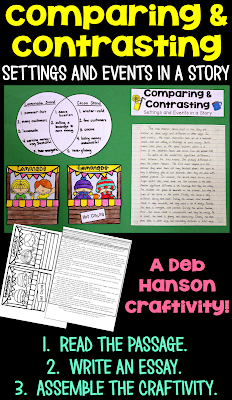 There are countless opportunities to teach the concept of comparing and contrasting - you can have students compare themselves and a classmate, two seasons, two sports... the list goes on and on! 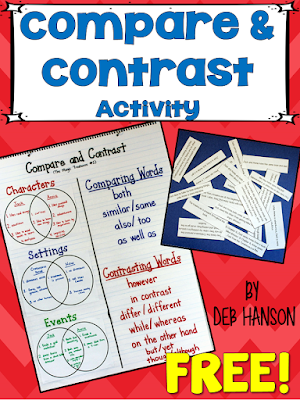 I will admit, I was still doing these types of compare and contrast writing activities with 4th and 5th graders a few years back. I would start with a Venn diagram, and then I would have students write a few paragraphs. 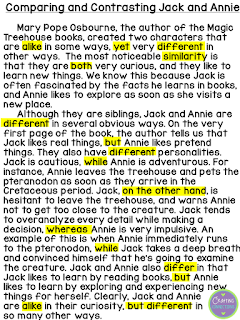 I was confident that I was giving my students (many English language learners) plenty of opportunities to correctly form compare and contrast paragraphs using the appropriate signal words. Recently, however, I've begun to question whether those past activities were enough. 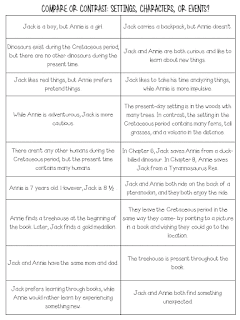 A few months ago, I was looking at the Common Core State Standards, and I was surprised to see how often some sort of comparing and contrasting task are included in the 5th grade reading standards! 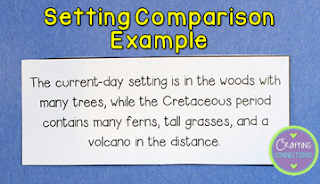 Therefore, I set out to create some materials that incorporate reading into my compare & contrast unit, by specifically addressing RL.5.3. RL.5.3: Compare and contrast two or more characters, settings, or events, in a story or drama, drawing on specific details from the text. I chose this simple book because I have found that nearly every fifth grader has read this, or another, Magic Tree House book in the past... or a teacher has read it to them. That said, I truly believe you could successfully facilitate this lesson with students who have never read the book, as well. I would begin class by holding up the book and asking students who have previously read the book to raise their hands. I would state that these will be our book experts, and those who haven't read the book before might be asking them some questions. determine whether their statement makes a strong enough comparison to list on the Venn diagram. 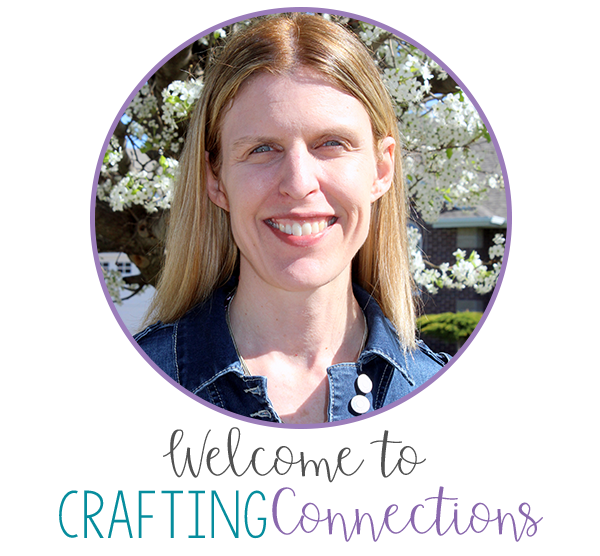 determine whether their statement belongs on the setting, characters, or events Venn diagram. determine whether their statement is a compare statement or a contrast statement. When I started teaching, I quickly learned that some students will state very shallow comparison statements if you let them. 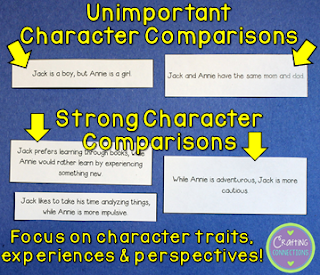 Therefore, I try to teach my students to write "deeper" comparison statements- ones that focus on character traits, experiences, or perspectives. 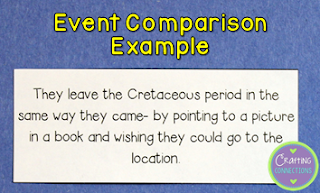 For this activity, if a student correctly determines that he or she was given an unimportant comparison statement, we simply toss the statement in the garbage and do not include it on the Venn diagram. 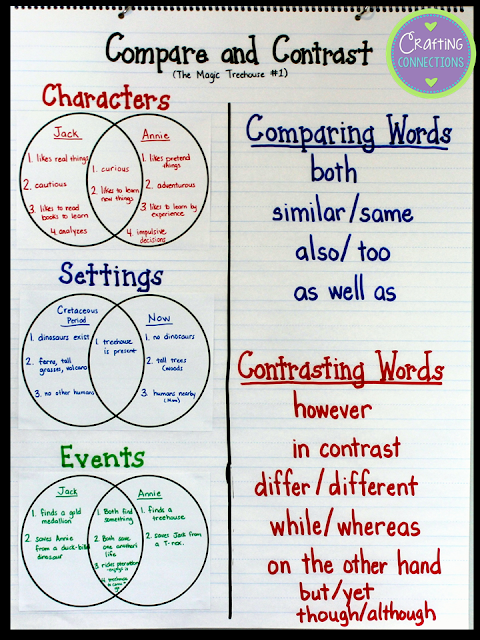 Once we have completed the anchor chart, I would have the students help me write a compare/contrast paragraph using some of the signal words. (I usually just focus on the "characters" Venn diagram. This is where our "experts" would come in, because after each statement, I would require students to support it with evidence from the text. 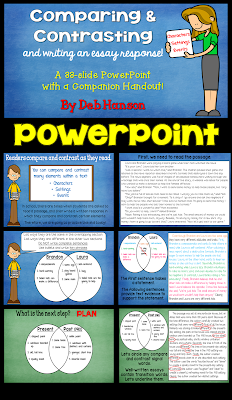 I would use the document camera to project my writing, and have students copy it into their notebooks. We would then highlight the signal words we used. If you want to download this lesson to use in your own classroom, please click HERE. 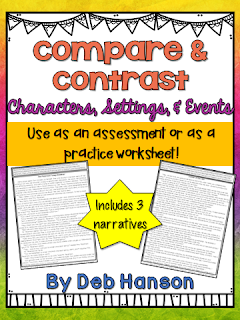 If you are looking for additional Compare & Contrast activities to use with your upper elementary students, please check out any of the following resources that interest you! Looking for more reading activities? Follow my Reading board on Pinterest! I'm so sorry, Kelly! I incorrectly secured the document. I just uploaded a new version that you should be able to print now. Thank you so much for taking the time to let me know! Thank you Deb! It worked and I was able to print it! Thanks again for another awesome lesson!!!!! Love this! I even plan to use with my middle schoolers with a bit of tweeking, if needed. But I am having issues downloading; i've tried clicking multiple images separately but no luck. Please help!